I can only imagine what Bertie went through in making these beans because he must have had to tried millions of recipes per se to perfect the taste of his beans. I've only had a few beans and am already afraid to try the next flavour . . . The first bean I had was banana, which isn't my favorite candy flavour but it was tolerable. I then had earwax, which despite its taste, I was able to swallow. Next came vomit. My friend, on a dare once, had to eat 13 in a row, and now says she will never eat Bertie Bott's every flavour beans again. So I thought what the hell might as well try it, if my friend could suffer 13, I can suffer 1. Well, it wasn't that bad at first. Then, the flavour kicked in, and I had to spit it out and get some water. And you know how jelly beans kind of stick to your teeth for a while until they dissolve? Yeah, the taste lingered with me for a long while. It was gross. And then, I summed up the guts to try another one: booger. And that was by far the grossest. I spit it out as fast as I could. Blargh! Gross! Thinking about it just makes gag. So I was like no more. But curiosity got the best of me and I tied another: candyfloss. This wasn't too bad, I had thought it was gonna be Tutti-Fruitti though, as in they were the same color. Candyfloss made me feel like I had dental work done on me or something, which I guess is a good thing. I've also had grass and green apple since. The grass I had by accident because I thought it was green apple. And I think I will hold off trying the rest for now. I don't think anything will be as gross as booger though. But who knows, earthworm sounds pretty gross. Strike that, rotten eggs sounds very gross! So yeah, it's no wonder Dumbledore wasn't fond of these. 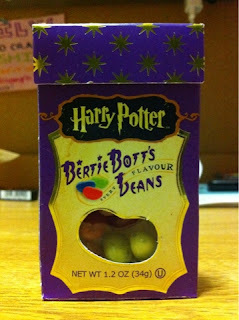 As he said in the Sorcerer's Stone: "Ah Bertie Bott's Every Flavour Beans! I was unfortunate enough in my youth to come across a vomit-flavoured one, and since then I'm afraid I've rather lost my liking for them-but I think I'll be safe with a nice toffee, don't you? Alas! Ear wax!" Update: I just tried black pepper which taste exactly like straight black pepper. It also gave me a cough similar as if I was smelling black pepper. And lemon was fine. But no more beans for me, for real this time.